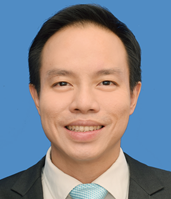 David Chin is a rhinologist ENT surgeon at Changi General Hospital in Singapore. He completed his ENT specialist training in Singapore in 2011 and subsequently undertook a one-year fellowship in rhinology and endoscopic skull base surgery with the Sydney Clinical Rhinology Fellowship. In addition to endoscopic sinus surgery for inflammatory and neoplastic disease, he has special interest in functional nasal surgery, objective nasal airway assessment, allergy and airway inflammation. His publications include a review on the inflammatory mechanisms in nasal polyposis and a manuscript on the outside-in approach for endoscopic modified Lothrop procedure. He has initiated an integrated airway service combining ENT and respiratory services at his hospital which aims to be a one-stop service for patients with combined upper and lower respiratory tract problems.